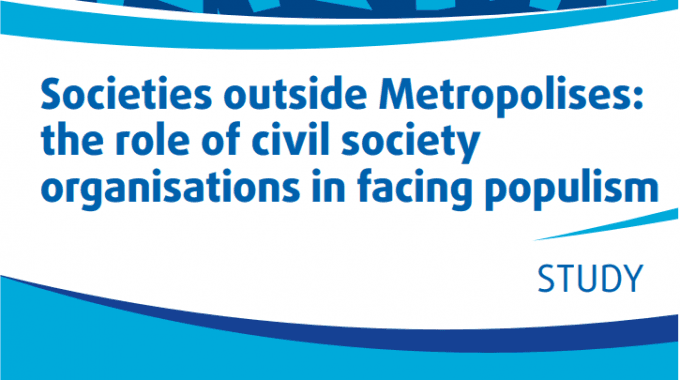 Study on “Societies Outside Metropolises: The Role of Civil Society Organisations in Facing Populism”, commissioned by the European Economic and Social Committee and executed by ECAS, looks to better understand the factors influencing citizens’ choices in favour of populism in non-metropolitan areas and if CSOs are equipped to counter it. Currently, populism in Europe is at its highest level since the 1930s. The average populist vote in the EU Member States stands at 24%, up from 8.5% in 2000. Right- or left-wing populists are members of numerous European governments while, in other Member States, populists also influence the agenda as members of the opposition, forcing moderate parties to embrace extremist policies. In this context, Euroscepticism is often the direct result of populist resentment. This phenomenon becomes even more complex as there is no factor alone to which the proliferation of populism can be attributed to. Rather, there is an interplay of factors, which feed on and reinforce each other. At their base, however, is one common element – people’s fears, which populists exploit to their benefit. The sample of countries examined in the study show that the factors not only differ across regions, but across social groups as well. The study, commissioned by the European Economic and Social Committee (www.eesc.europa.eu) and executed by ECAS, was carried out in eight non-metropolitan areas in four EU Member States with high populist votes – Austria, Italy, Poland and France. For each country, the study focused on two non-metropolitan areas presenting a level of income, economic and social development that is a) on or slightly higher than the EU average and b) below the EU average. In addition, there was extensive desk research, two statistical analysis, a survey that generated 616 opinions of citizens from the regions, three focus groups and 54 in-depth interviews with Civil Society Organisations (CSOs) and experts. 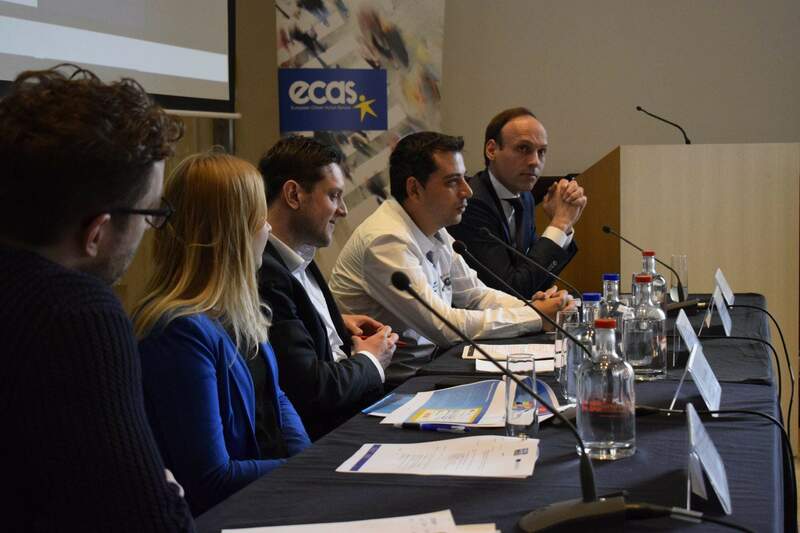 We aimed to have a comprehensive overview of the situation and a representation through which we could project most of the same conclusions of the study to other EU Member States. Throughout the study, it becomes evident that economic decline, social instability and limited levels of education are significant factors in explaining the increased support for populists throughout the EU. However, there are other interdependent and more important factors, such as the desire to preserve the status quo, to protect traditional values, monocultures or particular identities. What is commonly referred to as ‘identity politics’ – opposing ‘us’ against the elites and ‘others’. 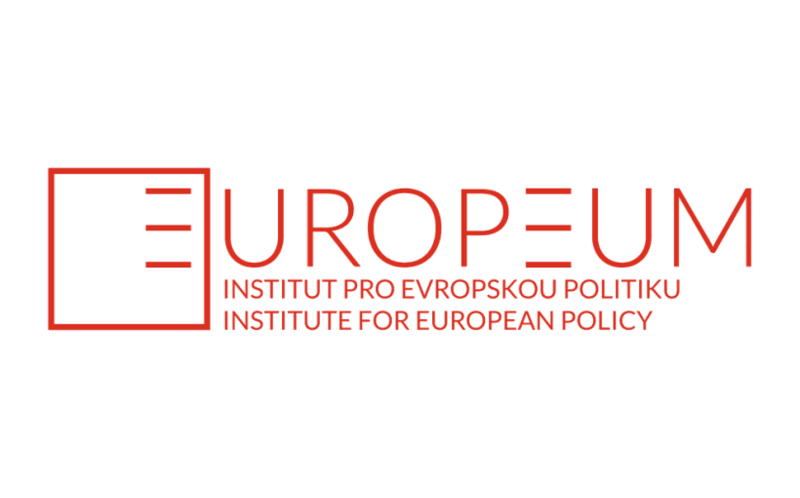 The crises of representative democracy, diminished trust in traditional parties and online disinformation strongly contribute to the wave of populism swiping through Europe. A large percentage of the respondents shared that they feel abandoned by, and therefore have lost trust in, traditional political parties and they are searching for an alternative to the current stagnant and incompetent political system. The study also asked and, based on the research, answered the fundamental question of what role can civil society play in limiting the populist propaganda. As an initial base point, it is worth to mention that CSOs widely do not acknowledge populism as a distinctive type of challenge. There is a lack of encompassing and comprehensive civic initiatives in tackling populism due to the complexity of the phenomenon, the shrinking civic space in terms of lack of an enabling environment for CSOs operation, limited human resources, reduced funding and a lack of expertise. What comes out of this study is the urgent need for support for civil society in the non-metropolitan regions, if we want it to play a role in, if not tackling, at least facing the challenges of populism. They need support not only in terms of funding and know-how and knowledge, but also in terms of developing cooperation in order to come up with more encompassing and comprehensive initiatives in tackling populism and to develop links across borders. 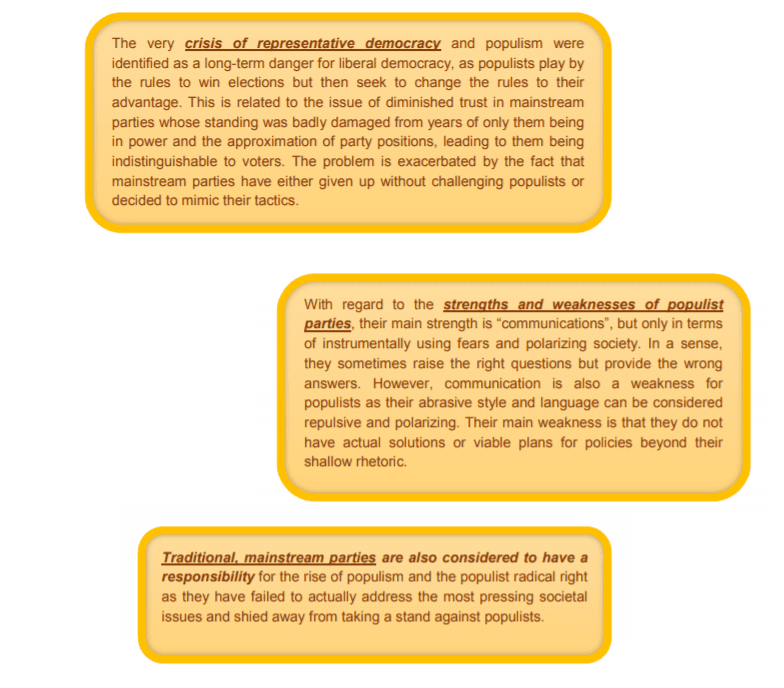 Based on careful analysis, the study concludes with ten proposals for CSOs and other relevant stakeholders on how to tackle the challenge of populism. For a detailed explanation of each recommendation, as well as activities that can help in achieving their objective and indications of the levels (local, national, regional or European) for which each recommendation is relevant for, access the full study here. To view and/or download the full study, please click here. To view and/or download the executive summary of the study, please click here.